Destress and Smoke Less: GOT GOALS? Did you know that if you don't have goals you are in the constant state of going nowhere? Did you know that if you are in the constant state of going nowhere, you can cause yourself some stress? As spiritual, and human, beings, we must move forward to feel good about ourselves. If we do not feel good about ourselves, our self-confidence and self-esteem is very low. If we feel low, we have a void, and we tend to fill that void with very stressful habits like eating, smoking, drinking, inappropriate relationships, or drama. Do you get up everyday, get ready for work or school, go to work/school, get home, watch TV, eat dinner, watch more TV, go to bed, and do it all over again? If you do, you are in the constant state of going nowhere. Life is a learning experience and one of the things we can learn is never ending goal setting. Whether we have small or large goals we will move forward in life. When we move forward in life we feel good about ourselves. When we don't have any goals we stay in the constant state of going nowhere and we feel displeased with ourselves. When we feel unfulfilled we feel unhappy. Unhappiness can stress us out. We have a choice, we can stay in the constant state of going nowhere or we can choose never ending goal setting. Some goals that you may consider are financial, relationship, health, or career. They can be big or small. If you would like to make more money you can make that a goal. If you would like to get along better with your spouse or family members you could make that a goal. If you would like to feel better physically you could make that a goal. If you are unhappy in your career you could make a goal out of looking for another job. The best way to set a goal is to think about what you want. Ask yourself, "What do I really want?" The answer may be to weigh less, or be happier, or to overcome anger, or make more money, or find an eternal companion, or to increase self-awareness, or to serve, or to find passion or purpose. These are simple wants and yet still goals. Once you have an idea of what you want you can take steps to obtaining your goal(s). First, think about the best for yourself. Dream and imagine what a perfect life would look like. Second, write your goals down. 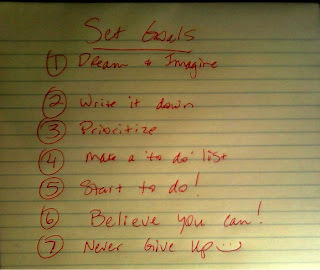 Fourth, write down all the things 'to do' to obtain the goal(s). Sixth, believe you will obtain them. Seventh, and final, never give up! Staying stagnant in our lives can cause stress because our lives may lack excitement or pleasure. Take time to explore what you really want out of life and move on it. If you move forward only one step at a time you will be that much closer to your goal, by that one step. Setting goals and obtaining them creates excitement and enthusiasm for life. If we are excited and enthusiastic about life we feel successful and that is what destressing yourself is all about, moving from stress to success. So, get your journal my friend, and start the never ending goal setting process. I'm gonna! Right now! You can too! You got the power! You can do this! If you need help through this process, the destress yourself class will take you through a step by step series of actions to help you explore, discover, and obtain what you want.